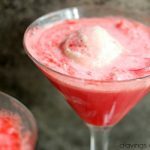 Simple to make at home, just a few ingredients and you are sipping summer in a glass! Or a mason jar to be more exact! Welcome to Day 4 of Ice Cream Week 2014! This year the event is hosted by Kim of Cravings of a Lunatic and Susan of The Girl in the Little Red Kitchen. We have teamed up with 25 amazing bloggers to make satisfy all your Ice Cream Cravings. I hope you buckled up for today’s recipe. It’s going to get a little messy in here. But first, let’s talk prizes for Ice Cream Week. 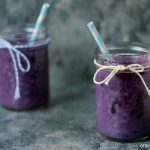 Simple to make at home, just a few ingredients and you are sipping summer in a glass! Fill glasses about 1/3 of the way with cola. Scoop ice cream evenly into glasses. Now pour the rest of the cola over top and wait for the magic to happen. It's messy so be ready for it. Garnish is you like, or if you're weird. 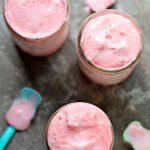 Serve with a big old cherry float loving smile! Mini-me: Don’t overfill the glass. Me: You don’t know me! Mini-me: Mom, don’t overfill the glass. Me: You can’t tell me what to do! Mini-me: You’re going to make a mess. Me: It’s like you don’t even know me at all. Don’t you trust me? Oops, my bad. Apparently she does know me, and should be able to tell me what to do. I really hope you’re enjoying Ice Cream Week as much as we are. I’m having a total blast. Clearly. Ha, I think it’s the Canada vs US thing. Our pepsi is awesome here, but when I visit the states I hate yours. I hate Coke here, but when I visit the states I prefer it. Weird right. Our pepsi is sweeter here, like old time pepsi. Ha, thanks Uru. I had a ball with this one. 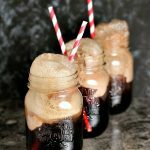 I love how you made your “own” cherry pepsi! 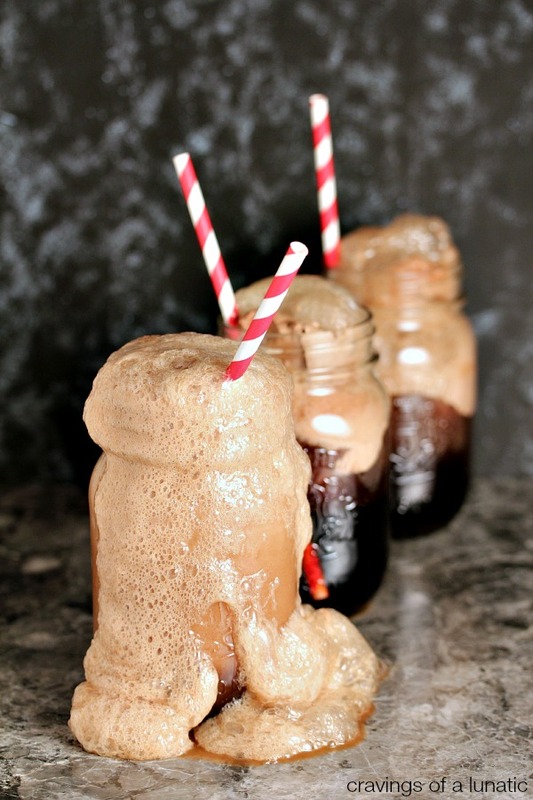 I haven’t made an ice cream float in eons….so much tastiness with so little effort. My kind of treat! The hunt proved futile yesterday. I cannot believe how hard it can be to find cherry pop here. Usually I keep copious amounts of it in the cellar but oddly ran out the one day I needed it. So hilarious. We all scoured the stores and nada. Hopefully we can hop across the border today for some. I heard the crossing has been difficult and long this week, maybe people back to school shopping or something. So I’m on the fence if I want to scoot across. I hate getting stuck at the border. Boytoy said him and his mom were about 45 minutes each way the other day, and people were acting nuts and cutting each other off. I may look into one of those cards that let you pass through quicker. Might be worth it. I just read your comment to Liz, Kim. I don’t think I’ve seen cherry cola here in Canada in YEARS. Remember in the 90s, it was all the rage to have different flavoured Coke/Pepsi? And they even had the clear Coke/Pepsi (it tasted like garbage so not surprised that didn’t last). I think I’d rather have your homemade version of cherry cola. And YEEEESSSSS to using chocolate ice cream. 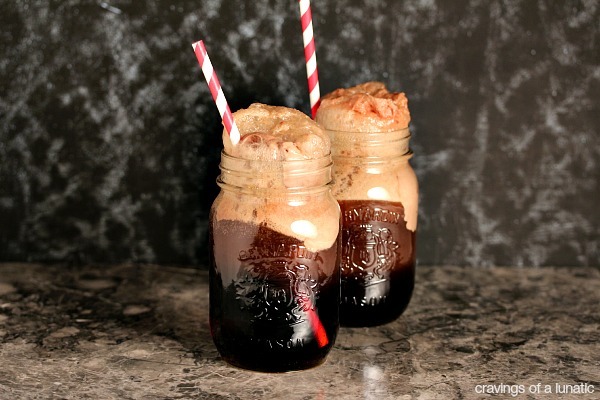 I used to make chocolate ice cream/Coke floats all the time when I was a kid. Wish I had a few mason jars of this right now! It’s like our country hates us or something. I mean how can you deny people cherry pepsi. It’s just wrong on every level. They’re lucky us Canucks are so easy going and apologetic. We’re all over here thinking it’s our own fault for not having cherry pepsi, heck we’d probably apologize to the store for even dreaming of asking they get some. Right. Can I get an amen sistah. I grab it whenever I see it and hit the states often for it. It’s a necessity for me, like air. You need mason jar? Come visit, I’ll send you home with a couple of hundred. I stockpile them. Everything in my house is inside a mason jar. Except people, that would be weird. Although a giant mason jar bed sounds really cool right now. It’s 3;30 am, what can you expect? Haha a mess is the sign of a good recipe! Ha, that’s good news for my kitchen. And family. Ha, I love that. So hilarious. Love, love, love this float! I roll like that, and I’m totally one of “those” people. P.S. Pepsi is better. Eff what you heard. Looks delicious, love a great float!! Oh man these look so delicious! I would never have thought to use chocolate ice cream in them but it sounds amazing! I made DH one of these floats tonight and he was on cloud nine!!!! I am on a low-carb lifestyle, but think I might try with Zevia soda and my low-carb vanilla ice cream. I know it won’t be the same, but blood sugar stabilization is more important than appeasing my wicked taste buds. Thanks for the recipe though as I will use as a treat for others who are not diabetic. 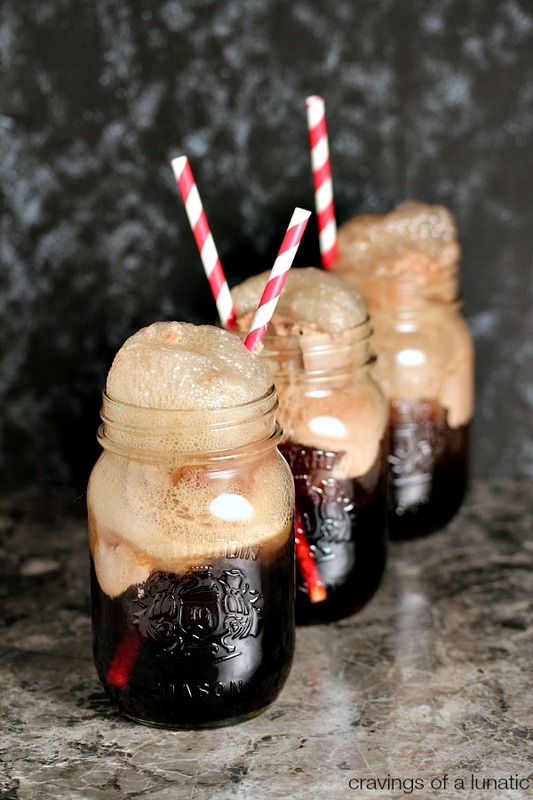 I just love floats and the idea you can make them less sugar laden is awesome. I’m such a sugar whore, but I know so many folks are dealing with diabetes these days. I love some of the products out on the market now. 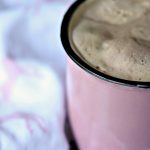 I tried some of the sugar substitutes last year and I know one of them really worked great. You couldn’t tell I used it in baking at all. I wonder if any caramelize like sugar though? I keep wanting to try to do some paleo friendly bbq rubs. But the key would be to get that caramelization that sugar provides. Something I plan to play around with. Goodness knows I could stand to consume less sugar and lose some pounds. Thrilled DB loved them too. I’m planning on trying a creamsicle version this weekend. Apparently I’m still very much in summer mode. This is definitely happening this weekend with the family! YUM!